A three-in-one bundle of suspense and page-turning excitement as missionary kid Kennedy Stern faces more danger, mystery, and controversy than this anxiety-prone college student knows how to handle. Confronted with questions of underage abortion, plagued by a stalker and paralyzing PTSD flashbacks, and eventually caught in the center of a police brutality scandal, Kennedy discovers that her first year at Harvard involves a lot more than passing a few lab classes and fulfilling her premed requirements. With her parents serving North Korean refugees overseas, Kennedy befriends a loving and highly opinionated pastor, his hospitable and encouraging wife, an eccentric but respectful roommate whose worldview is drastically different from Kennedy's, and a foreign lab partner who's harboring a grave secret he'd do just about anything to keep from being exposed. The Kennedy Stern Christian suspense series tackles controversial issues facing the church today and brings them to light in a way that encourages questions and fosters discussions without ever turning preachy or heavy-handed. 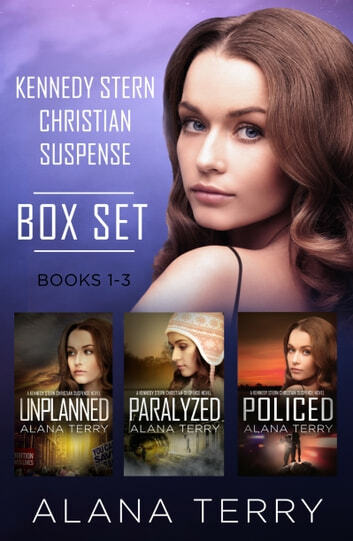 Find out why readers from all denominations, all walks of life, and all sides of the political spectrum are devouring this thought-provoking series from edgy Christian fiction author Alana Terry, who has won awards from Women of Faith, Grace Awards, The Book Club Network, Readers' Favorite, and many others.